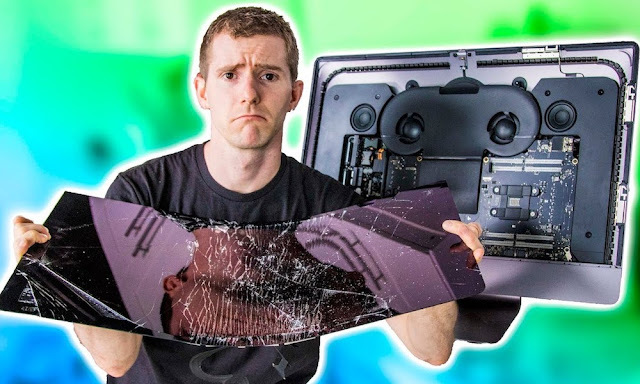 Both Apple and an Apple Authorized Service Provider declined to repair a damaged iMac Pro belonging to YouTube star, Linus Sebastian — host of the popular technology tips and tricks channel, Linus Tech Tips, according to a video published to his channel this week. However while the decisions may seem unfair, it’s worth noting that Sebastian (whose team has been in possession of the ultra high-end iMac since earlier this year) is 100% responsible for dismantling, showcasing, and (unsuccessfully) attempting to reassemble the $5,000 computer for their audience of 5.6 million subscribers to watch in awe. Sebastian’s official iMac Pro review, which was published back in January, shows his team completely disassembling the machine piece-by-piece — laying out its main components including the logic board, memory modules, LED-backlit Retina display and more. It’s when they went to reassemble the machine that Sebastian and his fellow tipsters allegedly dropped the LED display while attempting to reattach it to the aluminum-alloy chassis, which not only resulted in a thoroughly shattered heap of glass, but, according to Sebastian, a new logic board and power supply unit was deemed necessary, to boot. After realizing the damage they’d done, Sebastian and his team allegedly reached out to Apple about possible repair options, following-up with a visit to the Genius Bar at their local Apple Store. But the Cupertino tech-giant ultimately declined to service the machine, citing “limited availability of replacement parts,” according to MacRumors. That being said, Sebastian and his team appear to have reaped what they sewed, err, dismantled. And while the YouTube star acknowledged his awareness and familiarity with the Mac-maker’s policies, he remains adamant that given the fact he is willing to pay for the repairs out of his own pocket, Apple or an Apple Authorized Service Provider should still be obligated to repair his machine. Unfortunately, that’s not the case, either..
After Apple declined to service the iMac Pro, Sebastian and his team reached out to an Apple Authorized Service Provider in their home country of Canada — however the repair shop also declined to service it, citing, oddly enough, that Apple hasn’t yet offered them the requisite certification courses to service the high-end machine. Meanwhile, response to Sebastian’s predicament on YouTube has so far been mixed, with some commenting their agreement with the Tech Tipster and other’s siding with Apple, noting that policies are implemented for this very reason. Do you think Apple is obliged to service Sebastian’s iMac Pro if he’s willing to pay out-of-pocket for the repairs? Let us know in the comments!